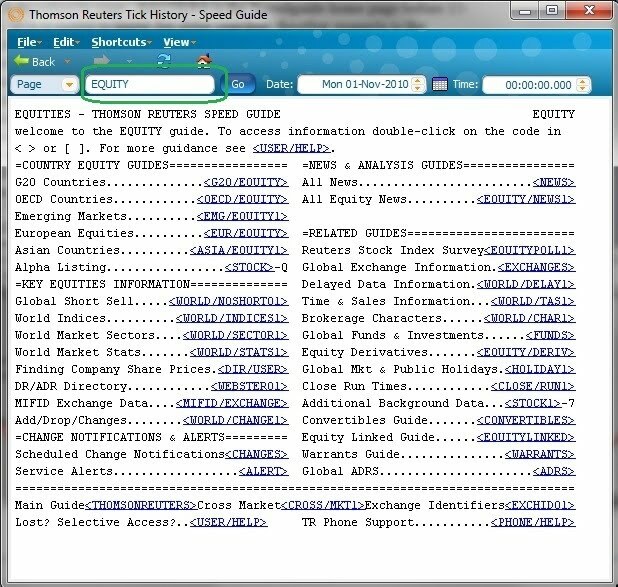 The Speedguide is an archive of quick reference information as it was available to customers of Thomson Reuters real-time trading network. As such it is an invaluable guide for navigating through the complexity of the world’s financial markets. You just need to recognise a few qualities to make the most of Speedguide. Firstly, the Speedguide is an archive of a real-time service catering to the needs of evolving markets. This means the Speedguide also evolves and changes from day to day. The date of the Speedguide is therefore an important input to consider before submitting a Speedguide request because the answers you receive will be specific to the date setting and can change from one date to another. By default the date is set to the latest available. But this may not be appropriate if you are interested in RIC codes from ten years ago. In that case, you will need to use the Speedguide from ten years ago. 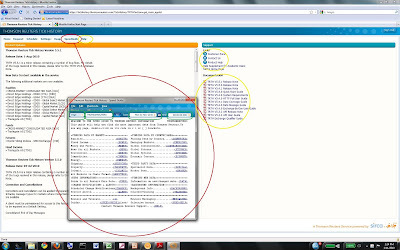 The following picture displays the Speedguide tab (marked in red on the Tick History screen), the Speedguide pop-up that results from left-clicking on the Speedguide tab (also circled in red) and Speedguide input fields (all shown in green boxes). The third green box shows the Speedguide date field. In this example it is set to “Mon-01-11-2010”. That field can be changed to anything back to “Mon-08-Jan-1996”, when the Speedguide begins. The fourth green box lets you define time during any of these dates for a required Speedguide. The second green box contains “THOMSONREUTERS” in the accompanying sample. This is the Speedguide’s home page. Any item marked in blue on a Speedguide page is hypertext to another Speedguide page of that name. For instance, left-clicking on “” will take you to the “EQUITY” page. Notice after clicking EQUITY the name in the green box changes to EQUITY. Notice too that entries at the bottom of each Speedguide page show the previous and next Speedguide page names in any sequence, or useful next locations. You can type other entries into the page name box and be taken directly to the Speedguide page with that name. For example, you could type “REUTERS” in that box and be taken to the REUTERS Speedguide page. 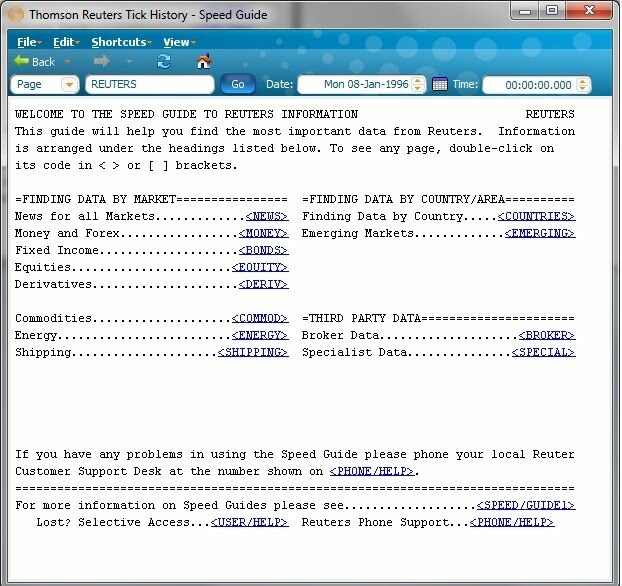 REUTERS is the Speedguide home page before 15-Apr-2008, so it is useful to know for older searches. Another example is the Speedguide page “0#.INDEX” (that’s a zero hash dot upper case i-n-d-e-x). Typing that and left clicking on the Go button takes you to a page displaying RICs for the world’s major indices on the selected Speedguide date. 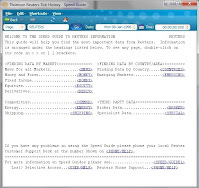 After you begin using the Speedguide you will notice that many pages keep their names across different days. That consistency is useful because you go navigate straight to those pages by entering their name on the chosen date. Of course, when you are unsure of a page name you can always navigate down from the home page (REUTERS or THOMSONREUTERS). 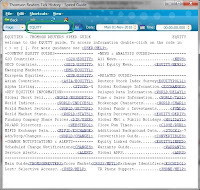 Other useful page names are: “G20/EQUITY” for a more direct entry into G20 equity markets where you will quickly see more Speedguide structure; “RULES1” which commences the definition of RIC structures; “EXCHANGES” which presents information about different exchanges; and “EXCHID01” which is a mapping between RIC exchange suffixes and exchange names. The final Speedguide input cell was the first enclosed by a green box above. In all the previous examples this was shown as “Page”. But it can be set to “Search” by clicking on the small orange down arrow. The “Search” option allows you to search the latest Speedguide for text typed into the page entry cell. Take note the search is only conducted across the most recent Speedguide. The date field does not function in “Search” mode. Nevertheless, you will find the Search facility to be enormously useful because it can quickly reveal the most useful Speedguide pages for your particular task. For example, suppose you want information on credit default swaps, or CDSs. You can Search for “default” or “CDS”. Among the many matches you will quickly locate pages of interest that can then be used as a basis for navigation through older Speedguides, after resetting back to the “Page” option. An important feature to be clear about is that the Speedguide date is not related to the date used to define your sample in Tick History. The two date fields serve different roles. One final feature to know is that you can open multiple Speedguide pages by holding down Alt-N or by choosing File -> New Window. Only one Speedguide page at a time will accept requests but all will remain visible. This can be very useful for keeping one Speedguide page open when you wish to temporarily navigate away from it. The sheer vastness of Thomson Reuters Tick History means that finding a specific asset can be a very daunting experience, particularly for our academic members who lack familiarity with financial market conventions. This problem is sometimes compounded by poor quality descriptions of what the underlying asset actually represents. These descriptions sometimes struggle to convey what the actual instrument is due to field length limitations. The main source of query we get in this regard is for Futures contracts. Consider for example the SFE 30 Day Interbank Cash Rate futures contract, known locally as “IB”. The contract which expires in January 2011 carries the following long hand description on the Tick History service: “30DAY INTER JAN1”, and has the Reuters Instrument Code: YIBF1. Imagine the problem that this gives the novice user who is using the Tick History Search function to try and isolate this contract. Here are a few handy hints. For futures contracts it is usually best to use the Tick History SpeedGuide, available on the product’s menu bar. Type in the word “futures” into the SpeedGuide and you will be presented with a well structured menu to help guide you. This will probably enable you to rapidly find the contract which you are interested in. It is useful to ascertain the stem of the futures contract and to them ask the Tick History product to tell you all the associated contracts with this stem over the time period which you specify. Stick with the above example, the stem of the SFE 30 Day Interbank Cash Rate contract is YIB. If you enter 0#YIB: as a search request in Tick History, the database will list each individual valid futures contract associated with the stem. The “0#” before the stem is the instruction to expose a “chain” of underlying instruments associated with a master contract or instrument. The colon “:” relates to the futures asset class. If we look at the individual contracts novice users often scratch their heads about the strange letters which appear in the instrument code. Using the example above for the Jan 2011 SFE 30 Day Interbank Cash Rate contract, the code is YIBF1…..”YIB” being the stem, “1” being the year, as in 2011, but what is the “F”.